Here are the information literacy basics for second semester students taking the 199 Research Based Writing Course. Ulrichsweb is a database that will help you identify if a journal is scholarly. Type the name of the journal that published your article. Look at the Content Type and whether it is "refereed" (which means peer-reviewed). Website to help you critically analyze infomation sources. Video to help you evaluate websites. Video created by the David L. Rice Library, Instructional Services. University of Southern Indiana, December, 2009. Video from the University of Washington Libraries explaining scholarly journals. Scholarly sources are often required for college level research. They have the highest level of authority, as they are written by experts in the discipline, generally PhDs. Many but not all of them are peer-reviewed, also known as refereed, In the peer-review process, articles are scrutinized by a panel of experts to verify accuracy, validity, and value to the profession. A Scholarly Source will ALWAYS be written by an expert – a PhD. affiliated with a college or university, for example. A Scholarly Source will ALWAYS include a long list of citations or references at the end of the work. Trade journal articles are written by those practicing in the field. The authors may be nurses, teachers, managers, engineers, etc. The purpose for the journal is to share information and practical strategies among people who are working in a profession. They are less lengthy and may have a few or no references at the end. Popular sources are those written by journalists or freelance writers. They are meant to appeal to the general public, often with sensationalized titles, glossy photos and illustrations, and many advertisements. Their main purpose is to entertain and generate revenue. 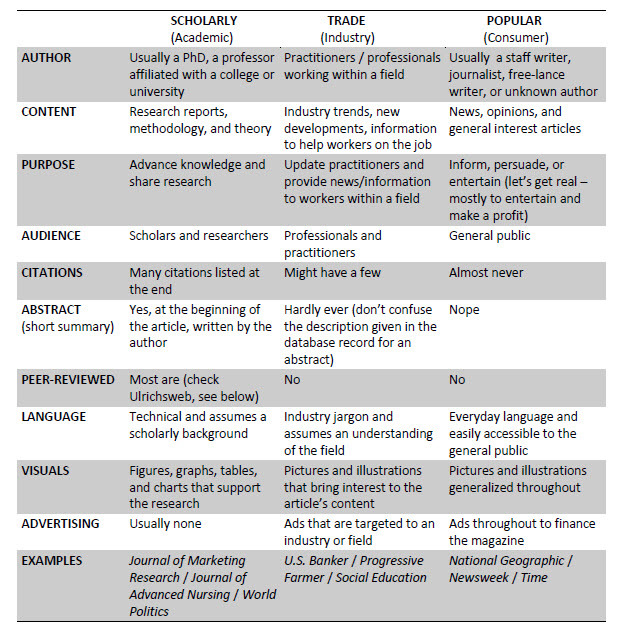 Use the chart below to help you compare scholarly, trade, and popular publications, or use the attached document. Before you begin looking for articles, have a clear sense of the assignment and your professor's expectations. What sort of sources are required or allowed? If you are not sure, ask your professor. A librarian can help you to locate proper sources and/or help you to review the sources you have found. Does it need to be current and topical? Does it need to be verified by scholars in the discipline? Does it need to be as unbiased as possible? Choose source types on these bases, with a critical eye. Test your skills, and email the librarian at the end.